As an independent nation-state, Thailand’s experience with the acceleration of decolonization during WWII was different from its neighbours. Under the monarchy, Thai foreign policy welcomed both the British in Burma and the French in Vietnam, which neutralized two long-standing threats to Thai security and hegemony. The situation changed during the 1930s, however, as both France and Britain went into decline, while Japanese influence in Southeast Asia rapidly increased. 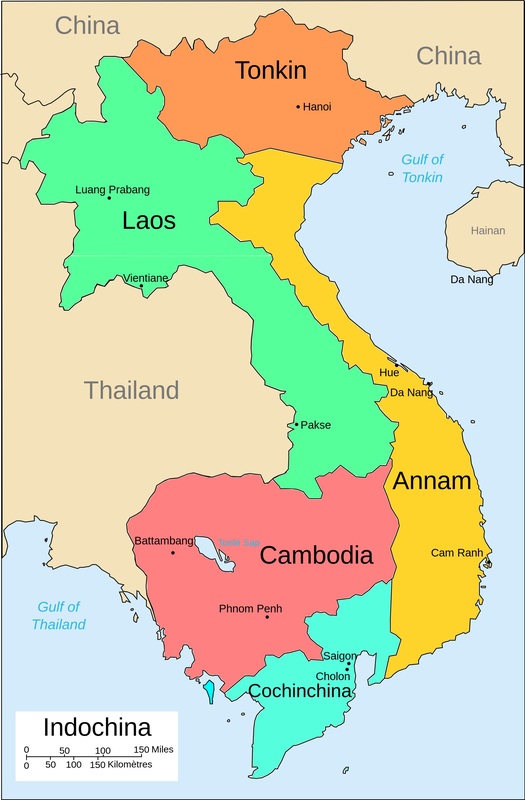 Beginning in the early 1940s, the Thai government looked for opportunities to support anti-colonial groups operating in mainland Southeast Asia. They did so for a variety of reasons. As members of Japan’s Co-Prosperity sphere, Thai leaders claimed it was their duty to support the independence aspirations of ‘Fellow-Asians’. This newfound sense of racial solidarity coincided nicely with the Thailand’s desire to bleed the western powers that had limited its own imperialist ambitions over the previous half century. By supporting anti-western movements during and after WWII, Bangkok hoped to project its own influence into the vacuum created by European decline. Even before the war, Thailand’s military regime worked to facilitate the departure of European imperialism – starting with Burma. As early as 1939, British envoy Sir Josiah Crosby reported that key members of the Thai government were shipping weapons to rebels in Burma by way of Thai students at Rangoon University. Bangkok also assisted in the training of Ang Sang’s ‘Thirty Comrades,’ and the formation of the Burmese Independent Army, an anti-British militia that crossed from Thailand into Burma in 1941. Thailand’s northern ‘Phayap’ army would follow in March 1942, invading the Shan States and conquering the city of Keng Tung. Later that year, Thailand officially annexed the region so that its ‘Thai’ inhabitants could be freed from colonial oppression. The Thai state provided similar encouragement to the Indian independence movement. In 1941, Bangkok’s Indian community formed the Indian National Council (INC), an organization dedicated to the realization of self-government in India. The next year, Thai Deputy Foreign Minister Wichit Wathakan attended the INC’s Bangkok Conference to decide the organization’s leadership and platform. The Indian National Army (INA), a militia founded to cooperate with Japan in the liberation of India, had a training camp southeast of Bangkok near the city of Chon Buri. Thailand served as a supply center for the INA during the ill-fated Imphal campaign, and the Phibun government assisted the evacuation of Indian troops from Burma. Bangkok allowed the INC to broadcast ‘The Voice of Free India’ over its air waves, giving Indian nationalists a media platform in Southeast Asia to counter the pro-British propaganda coming from Delhi. Thailand’s most significant contribution to the decolonization movement came through its support of Indochinese independence. During WWII, the Allies secretly shipped weapons and supplies into Thailand to support the formation of an anti-Japanese resistance group known as the Seri Thai. The abrupt ending of the war left this group in possession of a sizable cache of weapons, augmented by those discarded by departing Japanese forces. The leader of the Seri Thai, Pridi Phanomyong, began to funnel these munitions into the hands of the guerilla movements in French Indochina. In particular, the Viet Minh had many contacts with former Seri Thai members who now occupied important leadership positions in the Thai government, navy and police, and frequently traveled to Bangkok to purchase weapons. In the eastern provinces, the prominent Aphaiwongse family ran a lucrative business supplying the Viet Minh with rifles, machine guns and anti-aircraft guns. Public sentiment in Thailand was very sympathetic to the independence movement in Indochina. The governor of Nong Khai province harbored Lao Issara leader Prince Souphanowong after the Prince crossed the Mekong to avoid capture by French police. In Roi-Et province, clandestine groups used Buddhist temples as donation centers to raise money for the Free Lao movement. After the war, the normalization of Thai relations with Britain and France brought an end to its backing of anti-colonial groups. The return of Phibun Songkhram as Prime Minister in 1948, now a committed Cold Warrior, would bring Thailand to fight the very independence movements it had once supported. 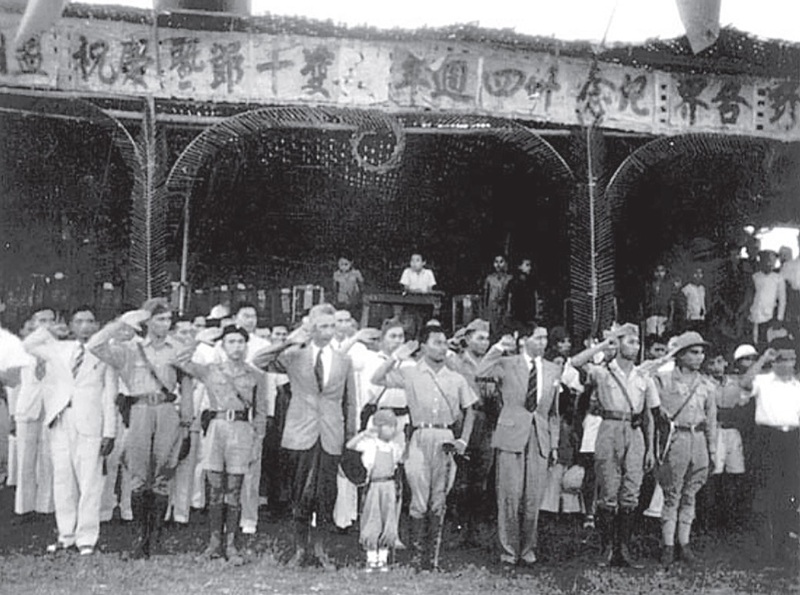 Viet Minh and Laotian officials on 1 November 1945, reviewing a parade of troops of the Chinese Nationalist 93rd Division in Vientiane. Prince Souphanouvong, commander in chief, Lao Issara forces, is in uniform in the front row, next to his young son, Ariya.